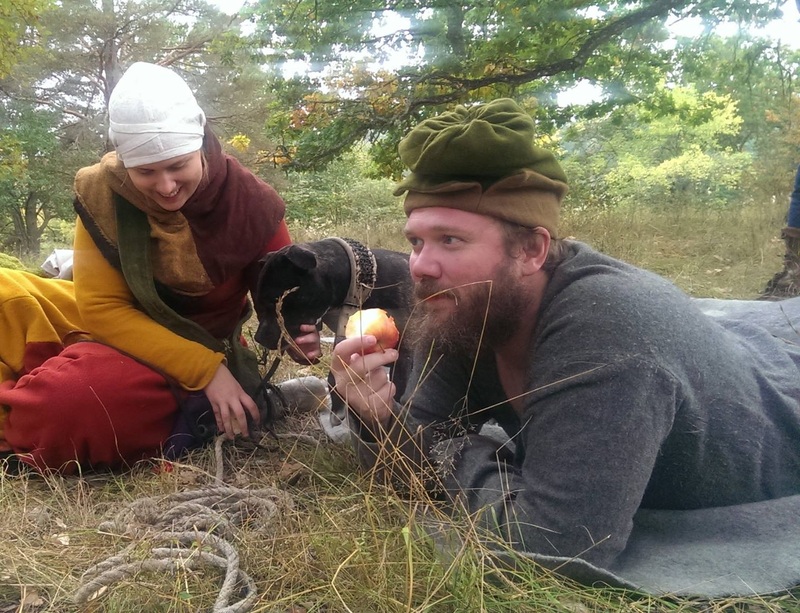 As autumn is moving in we thought that we needed to connect with all our friends that has seen us out and about reenacting hunters. 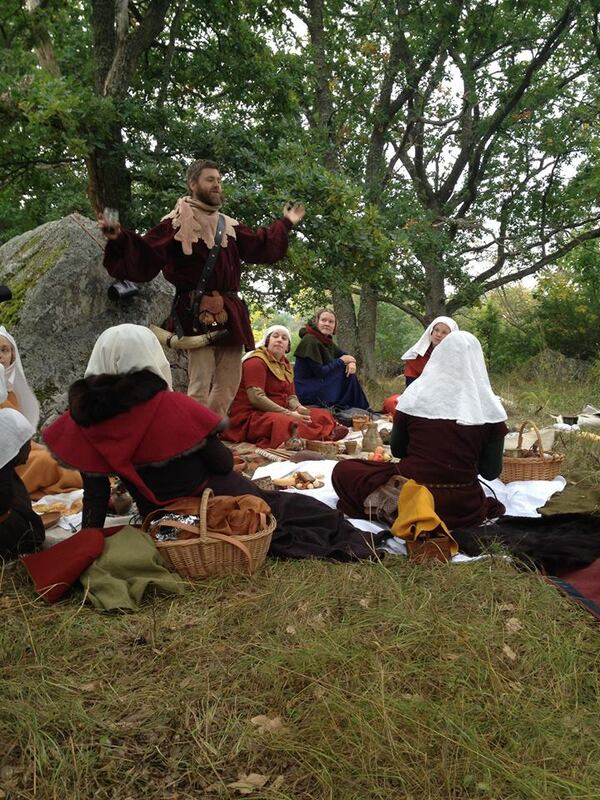 We also wanted to show people how easy it can be to gather in medieval a setting, and at the same time encourage those that has not been into reenacting in this way before to join up. 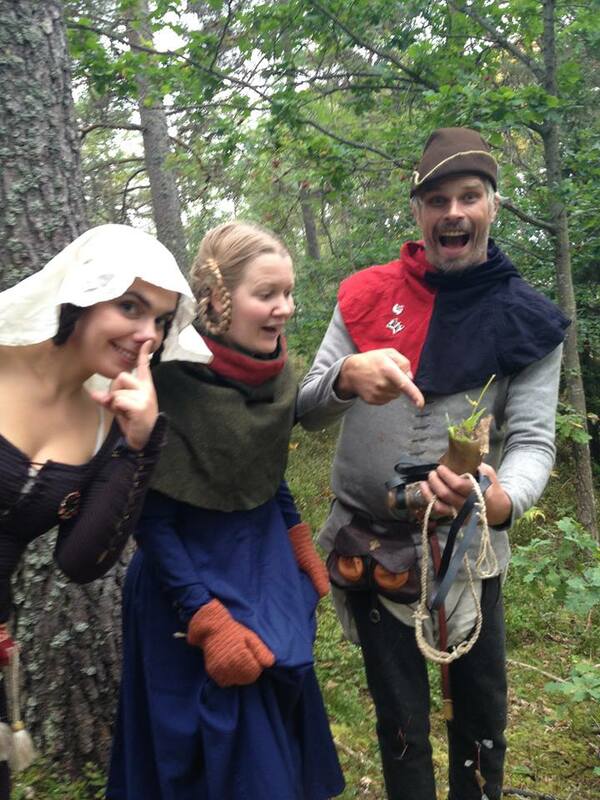 Of course, we also wanted to show some part of the medieval hunt, and also educate our fellows around this subject. The choice soon fell upon ‘The gathering’. 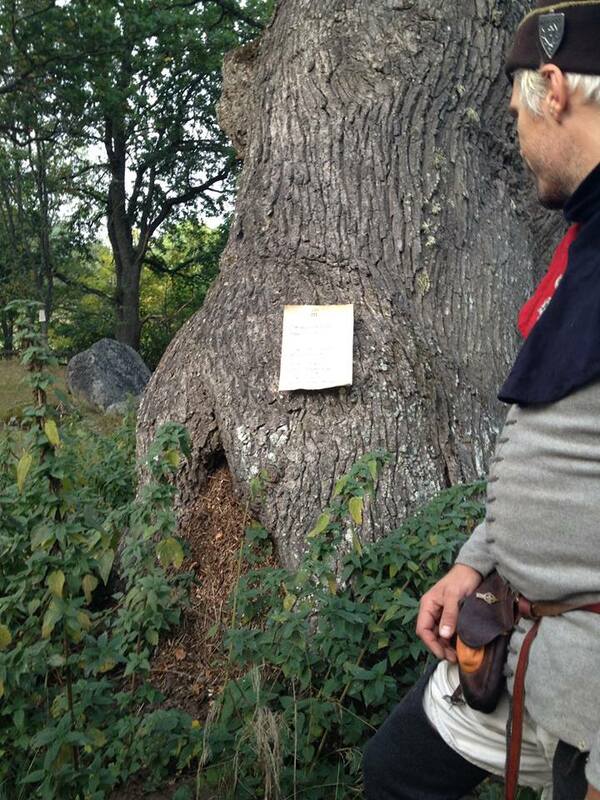 This is the place where the hunters gather and wait for all the preparatory work before the actual chase. 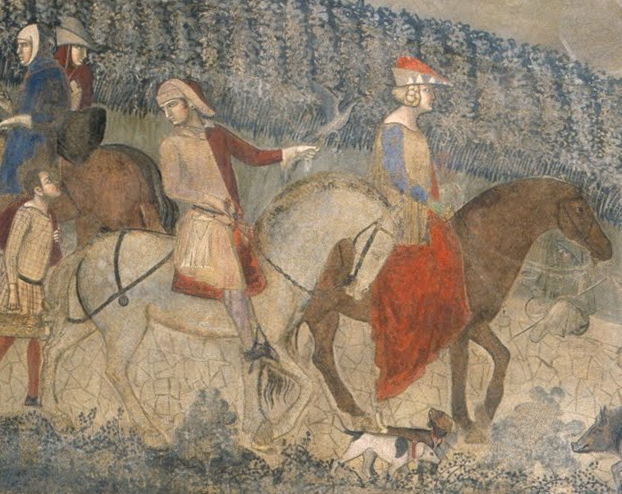 The great hunt, the hunt that was mostly praised and the hunt most huntbooks are concerned about, was a big affair. Many people and dogs where involved. It was usually prepared the day before, if not several days ahead. […]And also they that come from home should bring thither all that they need, every one in his office, well and plenteously, and should lay broad clothes all about upon the green grass, and set divers meats upon a great platters after the lord’s power. In the pictures it sure looks as described. Now, this was what we wanted! People eating and drinking and having fun! We decided to make the learning part of the event as a game. A three part game where two parts are team based and the last one was individual within the winning team. As we gathered all the participants took their roles seriously, broadcloth was layed out, some ate standing, some sitting and some on their elbows. Even laughing was done. There was some games going on in the background as we waited for all to gather. The always playful Alex had a whole bag of more or less demeaning games to throw upon us. One of these where ‘The three blind beggars and the pig’ – originally played with three blind beggars and a pig of course. The winners price was traditionally to get the pig for him/her self. 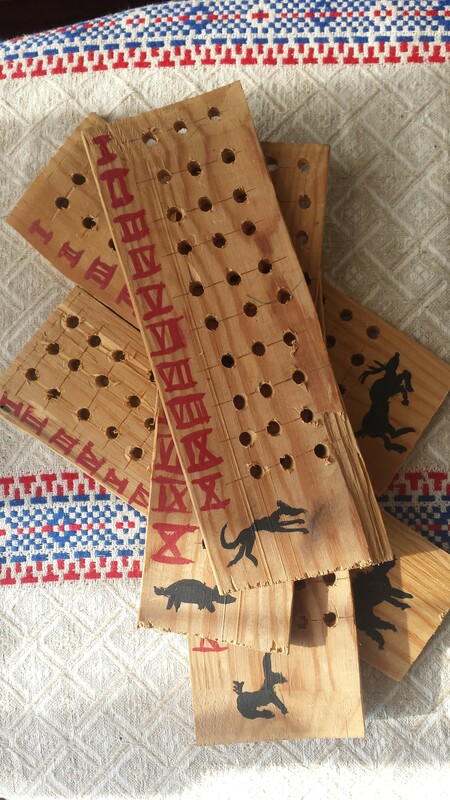 Even during medieval times this game was played with people just miming the roles. When all had gathered and had gotten something to eat to still their hunger, we decided it was time to start the games. The first game is closely connected to the gathering. If we look at the picture above.. there is one detail that most overlook, but is actually the most important part of the picture. 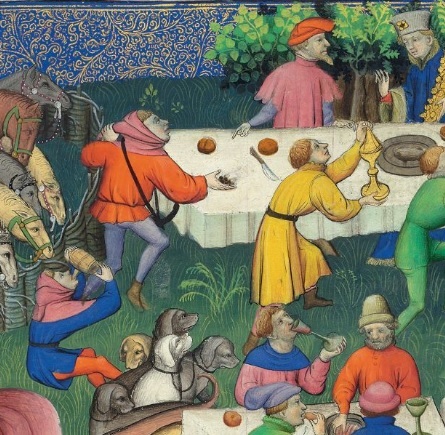 And that, is this man at the high table, presenting some brown balls to the huntsmaster. What he is doing is presenting the fumes, or poop, of the animal he has found. Judging by the shape and size, the huntsmaster will, with the help of a description of the track, decide the size, and gender of the animal. He will also see how much ‘grease’ the animal have. A animal in high grease was preferred because it was believed to be a sign of god health. 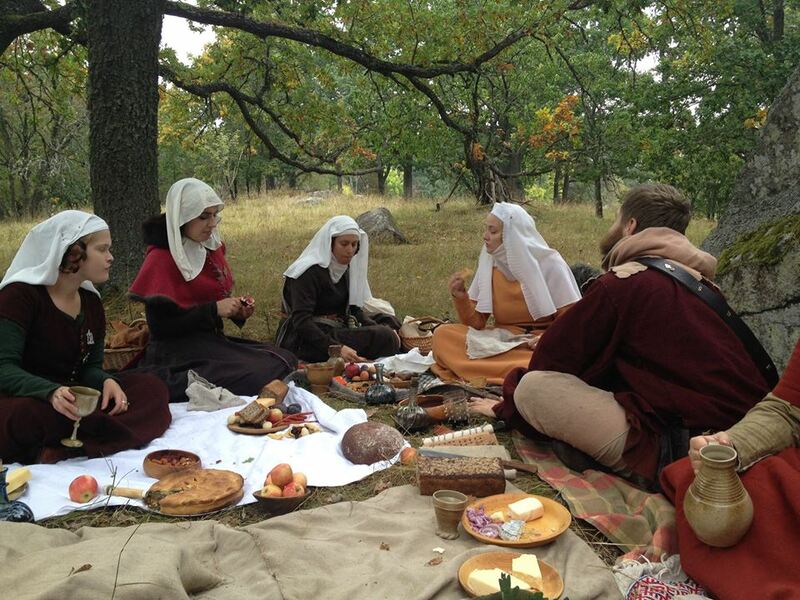 If you look closely at these pictures in the future, you will notice that this happen is all these picknick pictures. The presenting of the fumes was crucial for the hunt. The hunter was instructed to carry the fumes in his horn. Properly stuffed with grass to prevent them from falling out. In the picture above, from Les livres du roi Modus et de la reine Ratio, you can see the hunter pouring them from his horn. 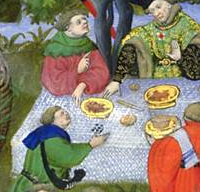 On the other, From Livre de chasse, you can see how it smudges the tablecloth. Boldly we set the hunters loose in five teams and soon they where off into the woods and fields to seek out fumes from prey. We had no idea at all if they would find anything, if they would be gone for the rest of the evening or if they would return in ten minutes, frowning at us for making them collect poo at their feast. Looking into ditches and field for that just perfect winning poo….. Happy hunters with a horn stuffed with grass. As the hunters started to filter back, they all looked perfectly happy and eager. Most could scarcely wait for all teams to come in before showing their little treasures to us. As soon as all the teams had found their way back, the judging could commence. We had, at the start, no idea what we would consider ‘good fumes’, and was prepared to go with “sometimes no poop is the best poop”. The judging was therefore completely arbitrary. The winner of this contest got a nice little golden stick, one that they had use for in…. 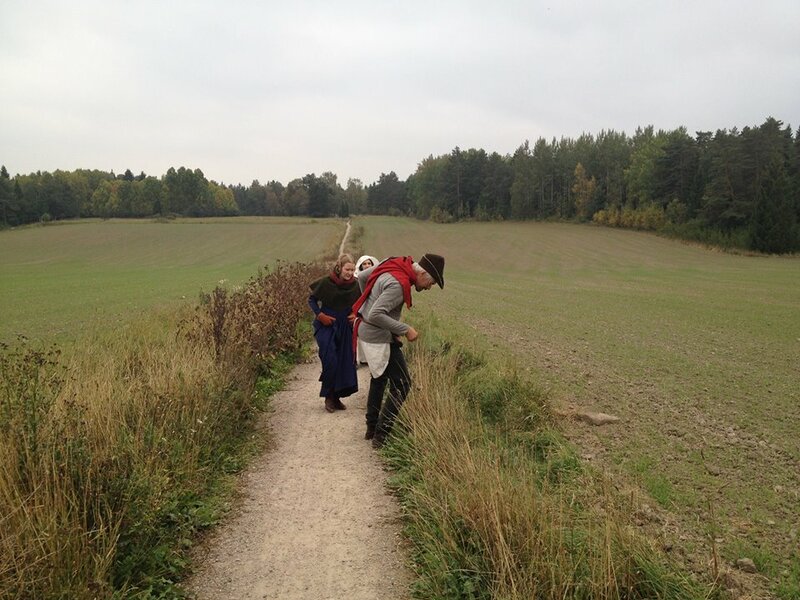 Part two was a rather non medieval walk-quiz (tipspromenad) with questions from the huntbooks. The questions had three alternative answers, so there was a one in three chance to get them right. We had chosen the more funny parts of the books as a base for the questions to give our participants a feel for how hilarious these books can be. To see the questions, in Swedish, you can go to our FB album. 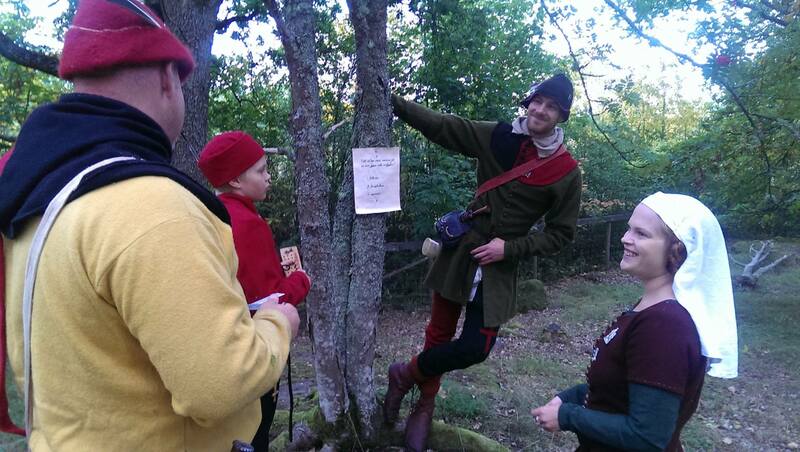 To answer the questions, we had made a very… medieval looking answering-board, where you put a stick in the hole that you thought corresponded with the right answer. The winning team had their golden plug, a token that would give them one automatic right answer on a question. But obviously this was to complicated a task to understand since they just left it on the side instead of using it on a question. Thus thinking it would just magically turn one of their wrong answers to a right one, and we let them have it their way. The second game resulted in a tie, prompting us to come up with a tiebreaker. 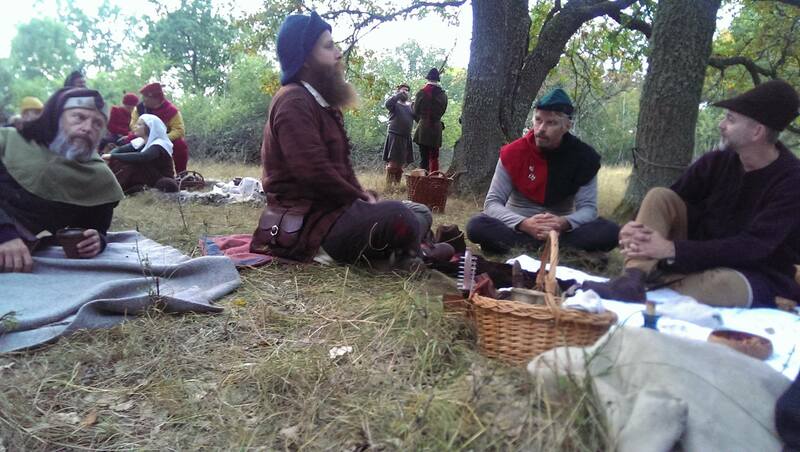 In true 14:th century style we let the two teams have a debate on the subject ‘Why do we hunt?’. Both teams came up with a similar explanation, stating mankind’s dominion over beasts, one team quoting the bible and the other the Greek philosopher Aristotele who was in high regard during the Middle ages. As both teams core argument was so much alike, we deemed the team relying on Aristotele the winner because of their skilled use of classic rethorics. The third game was to establish who really was the greatest hunter. So the winning team now had to compete amongst themselves to establish one winner. 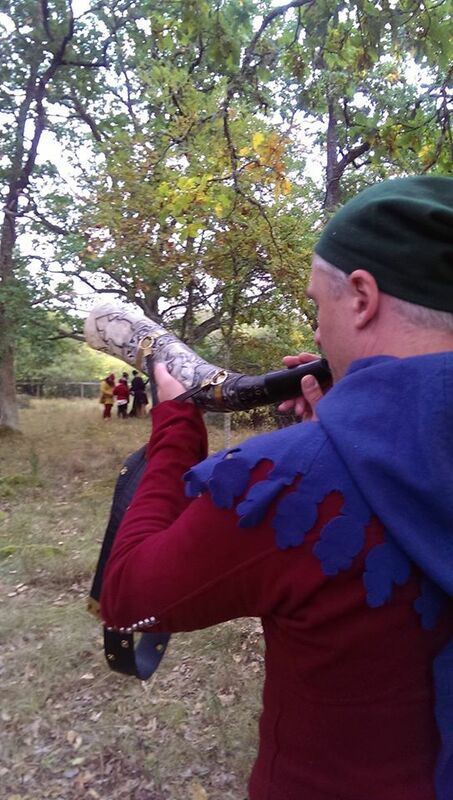 The contest was to blow a signal on the hunters horn. We choose one of the simplest signals, “The game is afoot”, blown when the game has been moved by the lymer and is up and running. This is for the rest of the hunters, the start of the chase. They all had to use the same horn, mine, and no one got to practice before. We showed them how the signal was to be blown… and let them loose. Most could not get a sound more then some wet farting, and few could get a note that was clear. Then stepped up, Martin, a member of St Huberts Rangers. He instantly blew a clear shrill note that made our bones shiver and the crows shriek back. Clearly this was our winner! 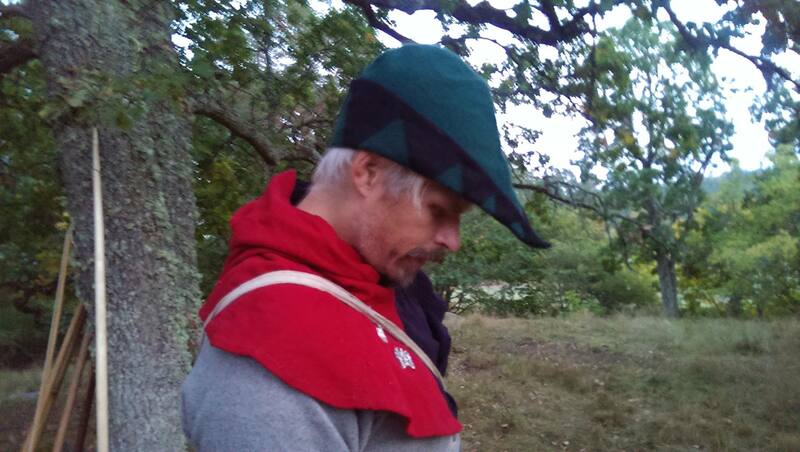 The prize was a nifty hat that Emil had made based on the one seen in the good rule. We where in good luck as it fit well on Martins somewhat big head. As the excitement of the games was reined in, people simmered down and had a joyful time once again. the somewhere around 30 participants dug into the food once more. Forgetting blissfully that those fingers just had been handling excrements of all kinds of dubious animals. As the evening closed in, the dogs started to take advantage of peoples slackening attention. 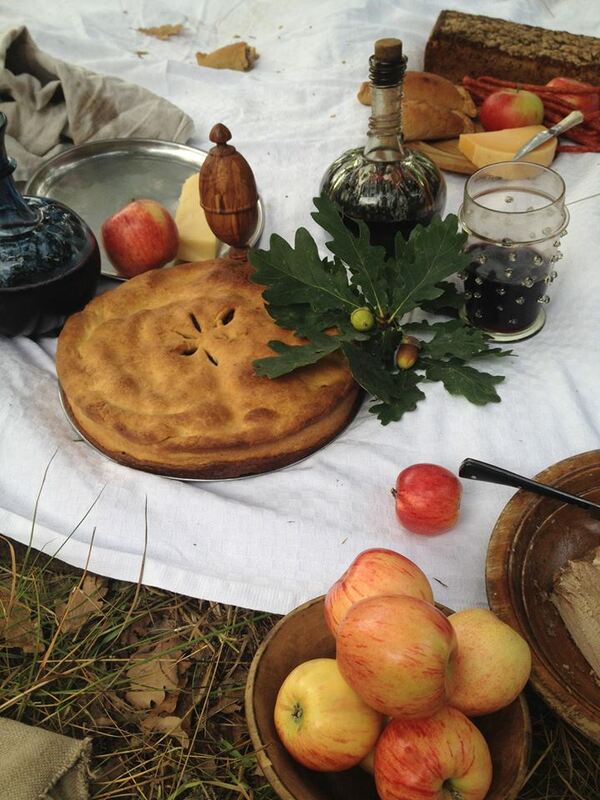 This was something that was most certainly an issue during the medieval times on these gatherings. 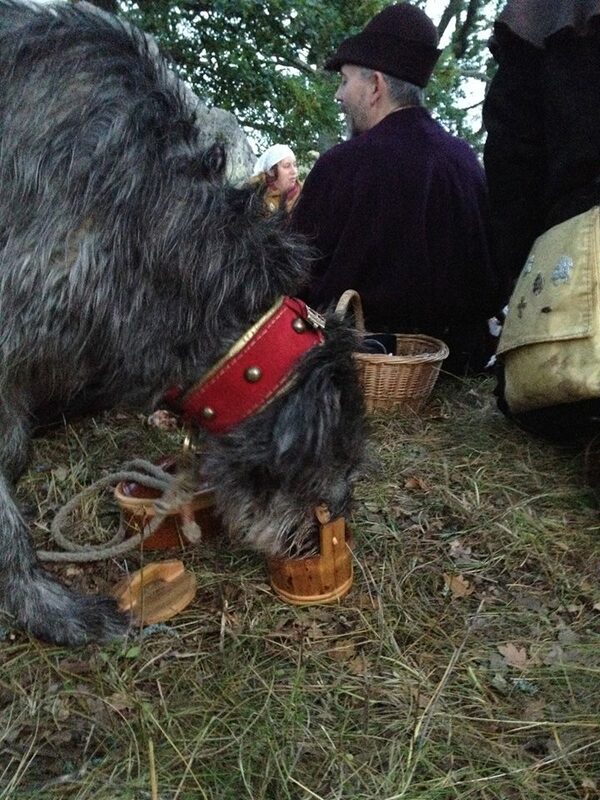 So for me this was a good part of the event, the participants needed to keep their food safe from the dogs. 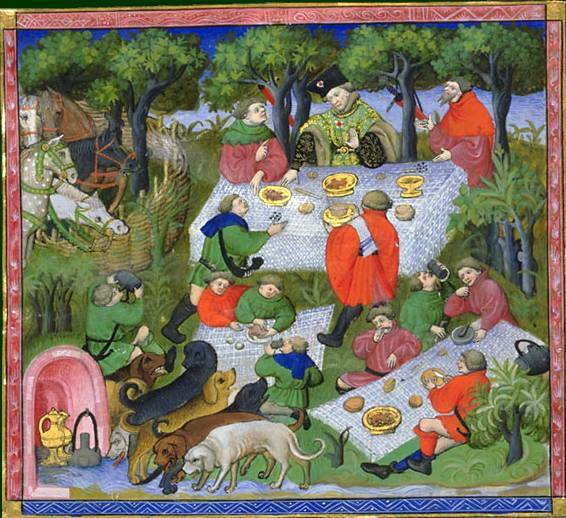 Because dogs was a really big part of the hunt ( I hope for more dogs to participate next time) foodstealing dogs add to the reality of the event., something Boudica was very much aware of and made the most of. I think her tally was half a meat, a small pie, some cheese, and this… that might have been some cheesecake. As evening turned into night the failing light eventually made us pack up and go home. It was a successful event, all those that partook seems to have enjoyed themselves. Hopefully they learned something, if nothing else they learned about new people. 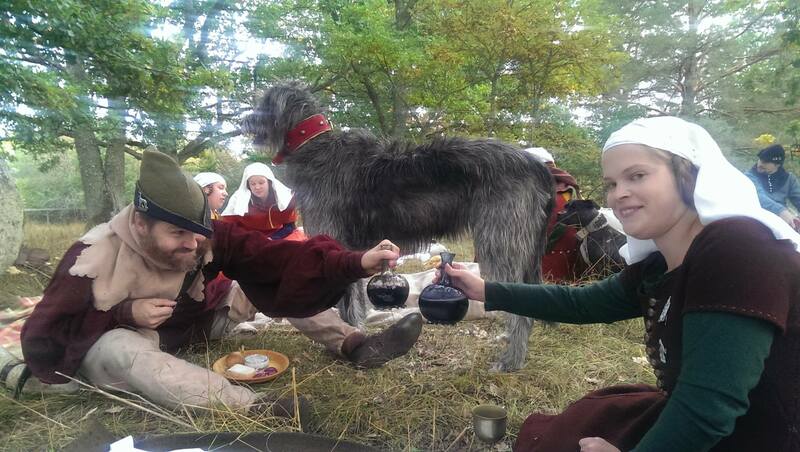 It was also a good event in time, as not much happens at the reenacting-scene in autumn. We like to keep active the year around, so spreading out events is a good thing. The scope of the event, in its pick-nick form was good, since it made the work less for the arrangers. Everyone brings their own things, just like the huntbooks advices. So, until next time, get out and have your own hunters gatherings!